Melaleuca lateritia, Robin Red-breast Bush, is an erect shrub that reaches a height between one and two metres. Light green, aromatic, linear leaves are two centimetres long. 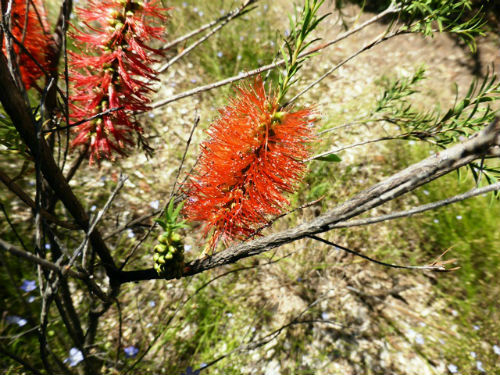 The bottlebrush-shaped flower spikes are orange-red, up to nine centimetres long with the main flowering period in summer with some blooms appearing in autumn and early winter. The flower spikes are visited by honeyeaters. M. lateritia is found in the southwest corner of Western Australia and is one of the most widely cultivated western species. The Robin Red-breast Bush has proved to be very hardy and free flowering. Occasional pruning will increase both foliage density and flowering. M. lateritia was named by Alfred Dietrich (1795-1856) in 1834. The location is listed as “Nova Hollandia”. As well as being a botanist Dietrich was a skilled botanical illustrator. The species name is from the Latin meaning brick red and refers to the flower colour.